This soup is like a really fancy ramen soup. 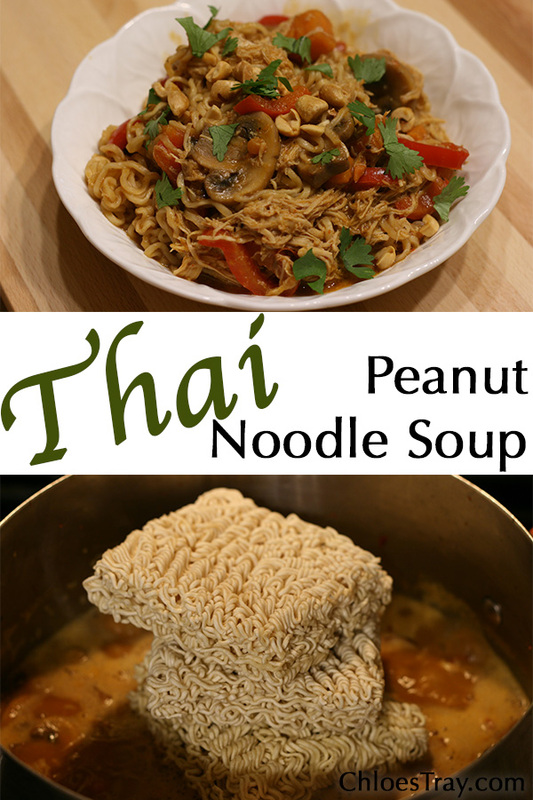 Peanut butter and red curry paste give this soup a lot of flavor, which is a huge difference from ramen and the flavor packet. Ramen has been a staple for many people for a long time, so this new version might bring back some memories. When I was cooking this, I was thinking about the first time I had ramen. It wasn’t something I ever remembered eating at home. I was in high school and had went to a friend’s house after school and she made some ramen for me. I thought it was an odd after school snack, but gave it a try. I think I might have only had one bite and didn’t eat any more. I’m not sure what I didn’t like about it, maybe the flavor was weird or it was just too plain. I hadn’t even bought any since then, but this soup really was a really good second try on ramen. 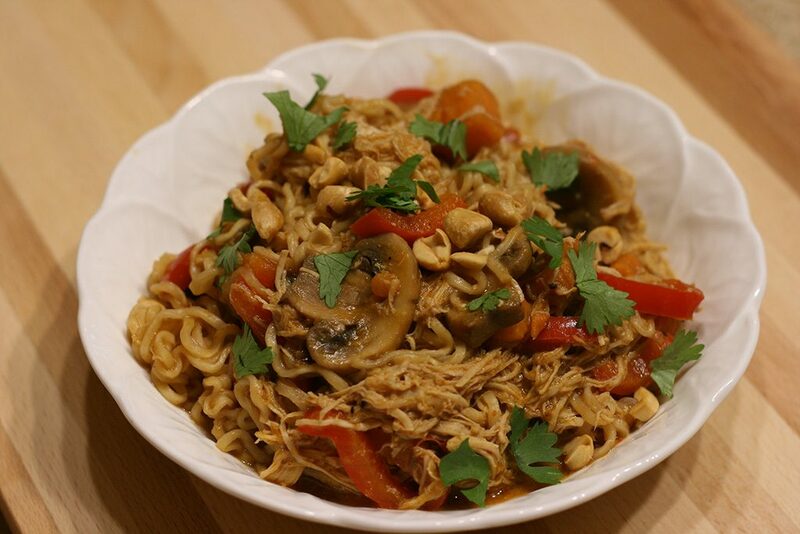 If you want to add tons of flavor and texture to boring ramen, then definitely give this recipe a try. Heat oil in a large pot over medium heat and cook the sweet potatoes and bell peppers until tender, about 8-10 minutes. Add ginger and garlic, cooking for about 1 minute. Add mushrooms and cook while stirring frequently for about 5 minutes to softened them. Stir in red curry paste and paprika. Add shredded chicken, broth, coconut milk, peanut butter, soy sauce, and lime juice. 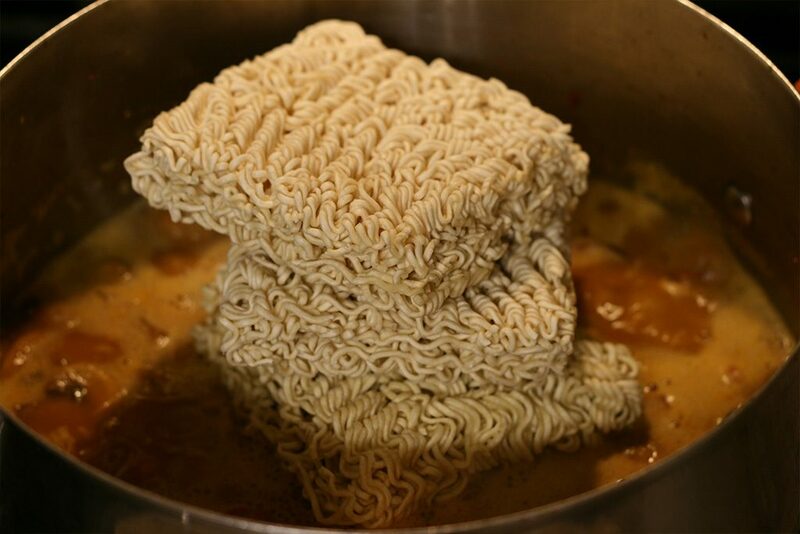 Bring to a bubble then add the ramen noodles. Cook while stirring for 3-4 minutes until the noodles are cooked. Serve with chopped peanuts and fresh chopped cilantro.